In large bowl, beat powdered sugar, butter and egg with electric mixer on medium speed, or mix with spoon. Stir in flour and salt. Divide dough in half. Stir cocoa into one half. Stir chocolate sprinkles into other half. Cover and refrigerate 1 hour. Roll half of plain dough into 9x8-inch rectangle on lightly floured surface. Repeat with half of chocolate dough; place on plain dough. Roll doughs up together tightly, beginning at long side. Repeat with remaining plain and chocolate doughs. Wrap and refrigerate at least 8 hours but no longer than 24 hours. Heat oven to 400°F. Cut rolls into 1/4-inch slices. Place slices about 1 inch apart on ungreased cookie sheet. Bake 8 to 10 minutes or until set. Immediately remove from cookie sheet to wire rack. 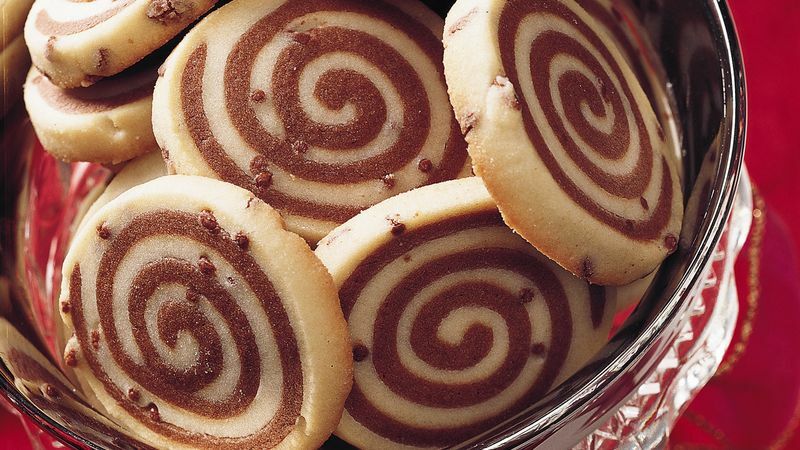 Wrap cookies tightly, label and freeze up to 6 months. Cookie dough can be covered and refrigerated up to 24 hours before baking. If it's too firm, let stand at room temperature until just soft enough to slice.